Q: What do raspberries, hibiscus, allspice and sea buckhorn have in common? A: They’re just some of the botanicals featured in La Bonne Auberge’s newly-expanded drinks’ menu, specially created to celebrate Scotland’s thriving Gin scene. A selection of Scottish favourites including Eden Mill Love Gin, Edinburgh Gin Raspberry Liqueur, The Botanist Islay, Caorunn Gin and Rock Rose Gin proudly sit on the new menu which now extends to 15 options. To ensure that customers order the perfect G&T, the menu also recommends the ideal Fever Tree tonic with which the gin of choice should be paired. 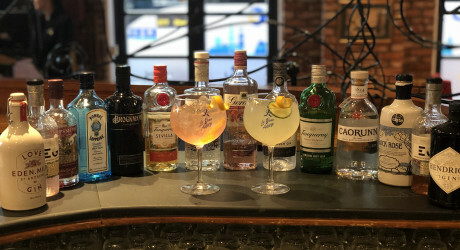 As part of the Gin-ebrations, La Bonne Auberge will also feature monthly guest gins from around the world to further demonstrate the versatility of the tipple which is fast becoming Scotland’s ‘other, other national drink’. The first guest gin will be one of the highest award-winning gins in the world, G’Vine, the luxury French gin crafted in the Cognac region, distilled from grapes and infused with vine flowers. Marc Jones, general manager of La Bonne Auberge, notes: “At La Bonne Auberge, we pride ourselves on offering great tasting, cooked-to-order meals made from locally-sourced ingredients at prices which, we believe, represent the best value for money in the city. To celebrate this new beGINning, 100 x 500ml La Bonne Auberge-branded Gin glasses have been specially commissioned so that the perfect drink is sipped from the perfect glass, making the experience even more enjoyable for gin lovers. BOMBAY SAPPHIRE GIN Aromatic with bright citrus note, paired with Fever-Tree Mediterranean Tonic. THE BOTANIST ISLAY DRY GIN Crafted on Islay with 22 foraged botanicals for a uniquely delectable and luxurious gin, paired with Fever-Tree Elderflower Tonic. BROCKMANS GIN Juniper is complemented by unique blueberry and blackberry flavours that deliver a distinctive fruit taste, paired with Fever-Tree Refreshingly Light Tonic. CAORUNN GIN Six traditional and five Celtic botanicals make this a crisp, aromatic taste adventure, paired with Fever-Tree Elderflower Tonic. EDEN MILL LOVE GIN Released for Valentine’s Day 2015, Love Gin includes hibiscus and rose petals amongst the botanicals, paired with Fever-Tree Elderflower Tonic. EDINBURGH GIN Refreshing, crisp and clean with smooth pine notes, paired with Fever-Tree Indian Tonic. EDINBURGH GIN RASPBERRY LIQUEUR Raspberry Infused Edinburgh Gin is made from a traditional family recipe using locally sourced Perthshire raspberries, paired with Fever-Tree Lemon Tonic. EDINBURGH GIN RHUBARB & GINGER LIQUEUR A delightful liqueur from the Edinburgh Gin company infused with rhubarb and ginger, paired with Fever-Tree Indian Tonic. GORDON’S LONDON DRY GIN A traditional refreshing taste from the finest handpicked juniper berries and a selection of other botanicals, paired with Fever-Tree Indian Tonic. GORDON’S PREMIUM PINK DISTILLED GIN The natural sweetness of raspberries and strawberries, and the tang of redcurrant, served up in a unique blushing tone, paired with Fever-Tree Aromatic Tonic. HENDRICK’S GIN Delightfully infused with cucumber and rose petal, paired with Fever-Tree Elderflower Tonic. ROCK ROSE GIN An alluring botanical selection including locally harvested rhodiola roses, rowan berries, sea buckthorn, blackberries and verbena, paired with Fever-Tree Elderflower Tonic. SIPSMITH SLOE GIN Cassis comes through with soft cherry hints and a rounded fruitiness, velvety mouthfeel and balanced sweetness, paired with Fever-Tree Lemon Tonic. TANQUERAY FLOR DE SEVILLA GIN Crisp juniper and zesty Seville orange, supported further by orange blossom, vanilla and allspice, paired with Fever-Tree Aromatic Tonic. TANQUERAY LONDON DRY GIN Clear and poignant juniper aromas with a light spice, paired with Fever-Tree Aromatic Tonic. Check out too twitter.com/allDrinkPR and twitter.com/allGlasgowPR.